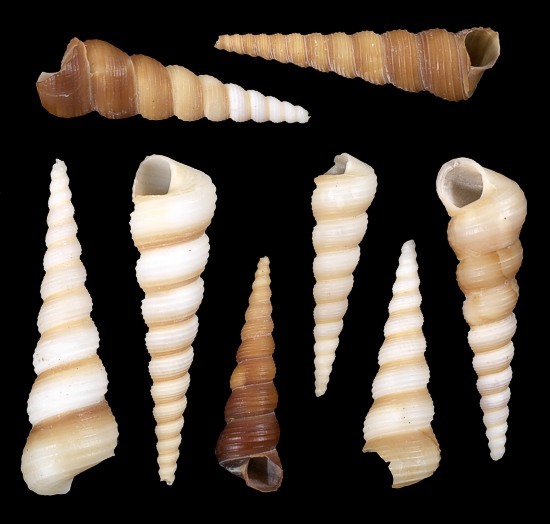 Family: Turritellidae (Deep Sea Augers, True Augers) Shells of this family are shaped like long, slender augers or screws and resemble Terebridae shells. However, the similarity ends there. 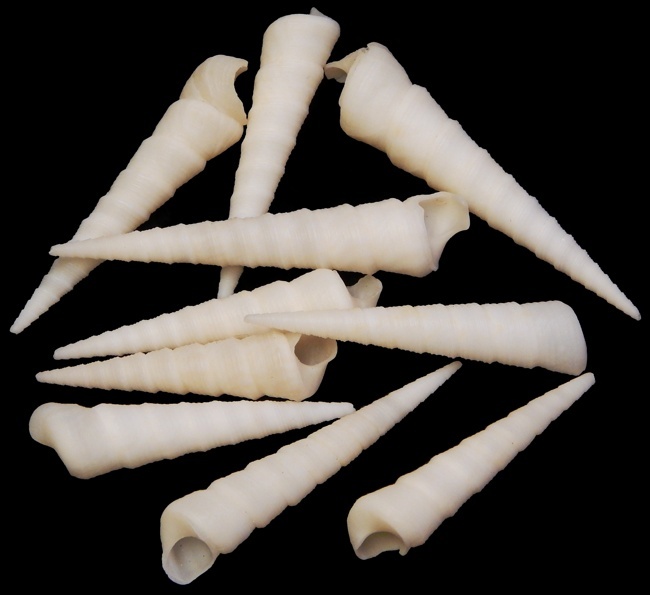 The turritella shell shape is somewhat variable, and shells are thin, rough and not lustrous. The rounded mouth and complete absence of a siphonal canal at the anterior end of the aperture clearly identify turritellas. 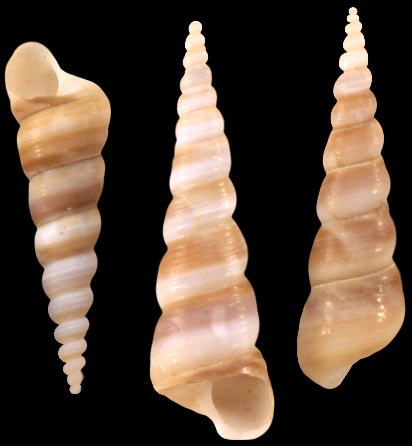 The shells have in addition: a very tall spire; numerous convex whorls; no umbilical opening; absence of folds on the columnella, and a horny, flexible operculum that is supported by flexible bristles. The operculum can be withdrawn far inside the shell when the animal retreats. 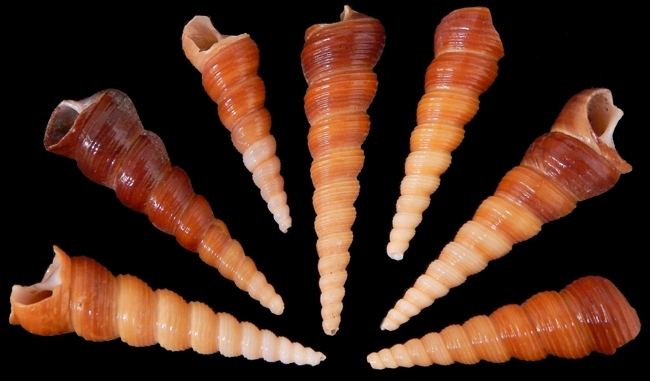 The "worm" shell genus, Vermicularia, is also found in the Turritellidae family. 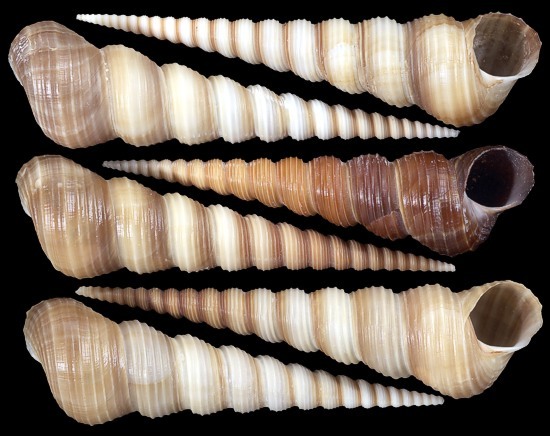 It is similar to Turitellidae shells except that the whorls begin to separate as it grows larger (see the superfamily Cerithioidea), and it can be difficult to distinguish from shells in other families of the superfamily. 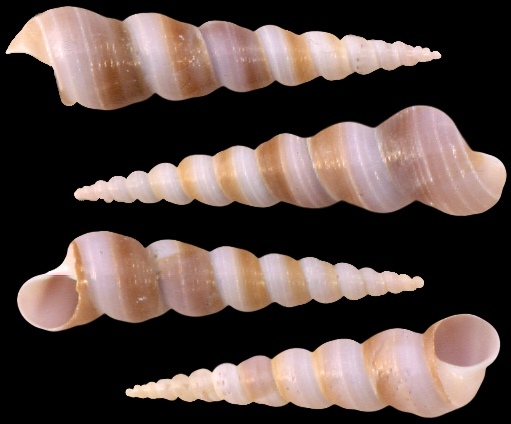 Moreover, any of the worm shells can be superficially mistaken for similar shells formed by certain annelid worms --a wholly unrelated phylum. These filter feeding molluscs burrow in sandy bottoms and feed on dust-like particles of detritus falling to the sea floor. 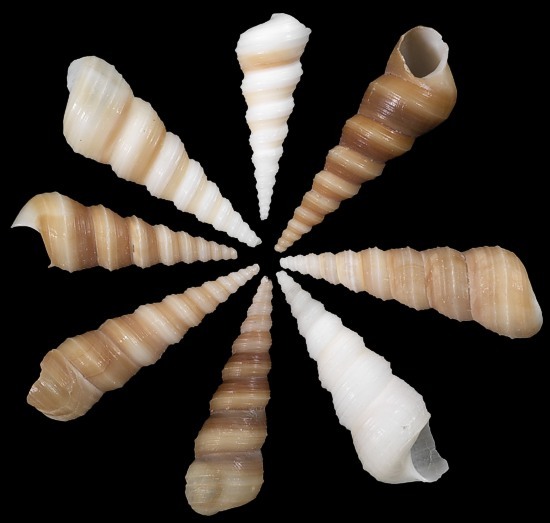 Quite unlike the terebra mollusc, the turritella lacks the venomous dart mechanism needed for an actively carnivorous life style Many turritellas make use of their gills, to filter out fine food particles much as clams do. Most of the tips are blunted.